Not Tuna but a great day out. I was supposed to be lure fishing for Tuna in Ancona in Italy over the weekend. Unfortunately due to the fallout from the hurricane that broke up over the Caribbean, the wind was too high for us to get out. Hopefully I am going to head over there in November. I was a bit depressed especially when I seen some of the pictures of Tuna, that the guys were catching off Ireland. I had one consoling thought and that was Luke Pettis, skipper of Snapper out of Weymouth had contacted me earlier in the week, saying he had a couple of spaces left on the boat. He offered a Bream and rough ground session, with the chance of an Undulate; my nemesis fish! To be honest the morning started off really slowly, we even struggled to get some Mackerel for bait. With the wind blowing from the North East most of the Weymouth charter fleet has decided to head round to the West Side and fish Blacknor or Stennis ledges. Luke opted to travel a little further West to break away from the pack. As the morning turned to afternoon Luke was doing his utmost to find us fish other than Dogfish. We anchored up on a mark not too far offshore and straight from the start we were into Bream. Then the fun began as species after species turned up. Bass, Mackerel, Pout, Dogfish and Conger made an appearance. I managed my first ever Ling, it was only small but I love catching a new species. 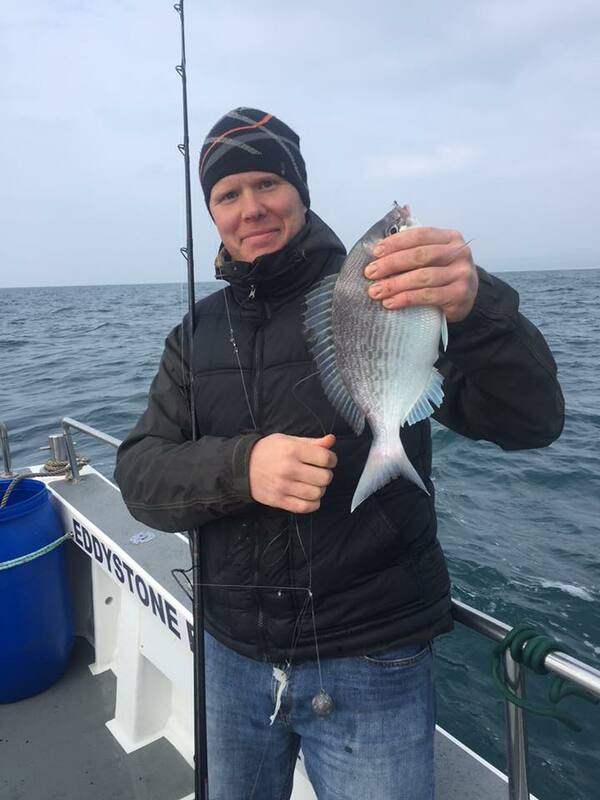 Almost all of the species were caught on Bream rigs. I decided I was going to go after an elusive (for me) Undulate Ray. I put on a big bait; two Squid and half a Mackerel on running 5/0 Pennel rig. I didn’t take long for a bite to develop. At first it looked like a Dogfish bite, but as I struck into it I realised that it was something much bigger, especially when it went off taking line. My first thought was it was a late season Tope. After a spirited fight we spotted some colour. It looked like a big Bullhuss, but as it came closer to the net, Luke shouted it was a big Cod, which he netted perfectly. Luke was just about to net it, when one of the other anglers on the boat shouted that he had hooked into something big as well. This time we were sure it was a Tope as it screamed uptide. It was no Tope, but anotehr Cod that spat out a 2lb Bass as it came on board. Amazingly it was caught on a Bream rig; a strip of Squid and a size 2 hook. The fish weighed 19 and 21lb. Talk about being happy. I was beaming for hours. It is not just from the boat that the Cod have been coming. 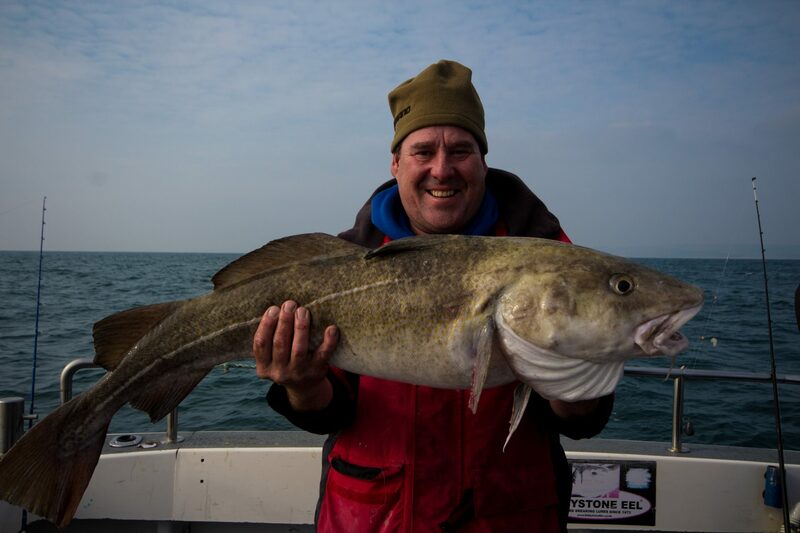 I forecast last Friday that I didn’t think Chesil would produce loads of Cod, and I was right. 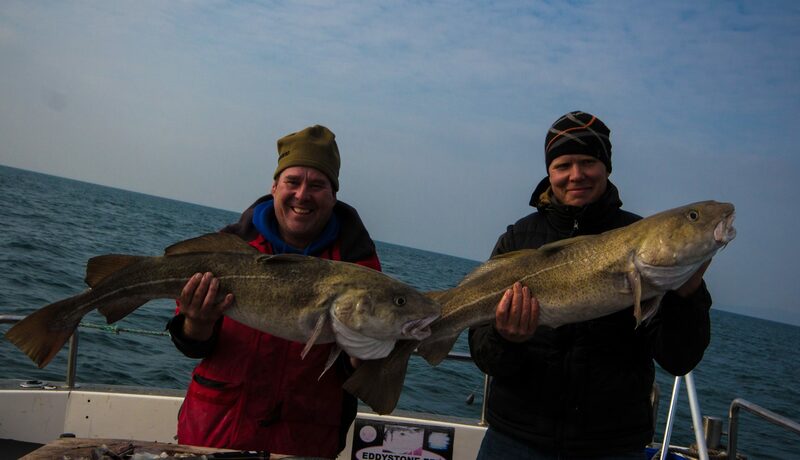 There was a few Cod caught, but nowhere near as many as mid week. However if you are going to catch a Cod you may as well make it a proper one. 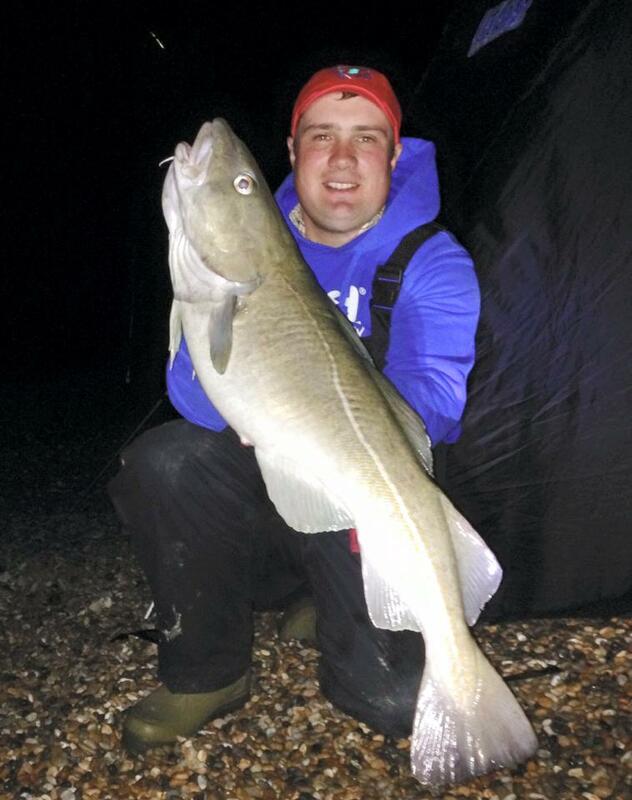 Shaun Nutley landed this 13lb 5oz. Cod from Chesil. It was one of several fish that he had. Chesil Beach forecast: With NE winds continuing all week the chances of Cod are pretty slim during the day. I would expect to see a few during night tides along with Whiting, Pout and Dogfish. Medium sized tides are always good for Rays, which can show anywhere along the beach. Daylight hours will produce Plaice from Cogden, Abbotsbury and West Bexington. Most of the Plaice at that end of the beach are around 1 1/2lb, but larger specimens can be caught at the far end of the bird sanctuary at Ferrybridge and towards bridging camp. Mackerel are still showing along with Bream, especially towards the Portland end. Garfish are present all along the beach and are really easy to catch on a float fished strip of Mackerel. 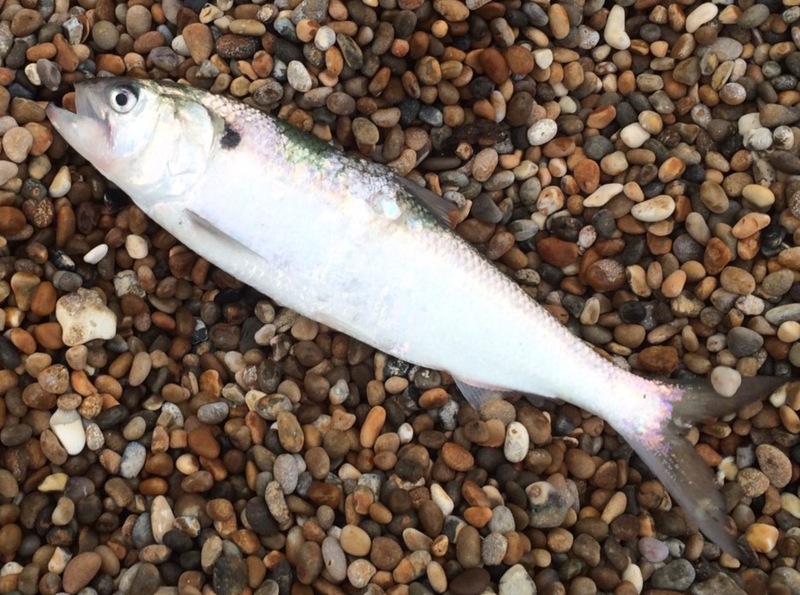 The beach can often throw up the odd rarer species as it did for David Cobb last week, when he caught this Shad. Portland: October often produces Bass from all around Portland. Lure fishing from the rocks is by far the most productive method of catching them. 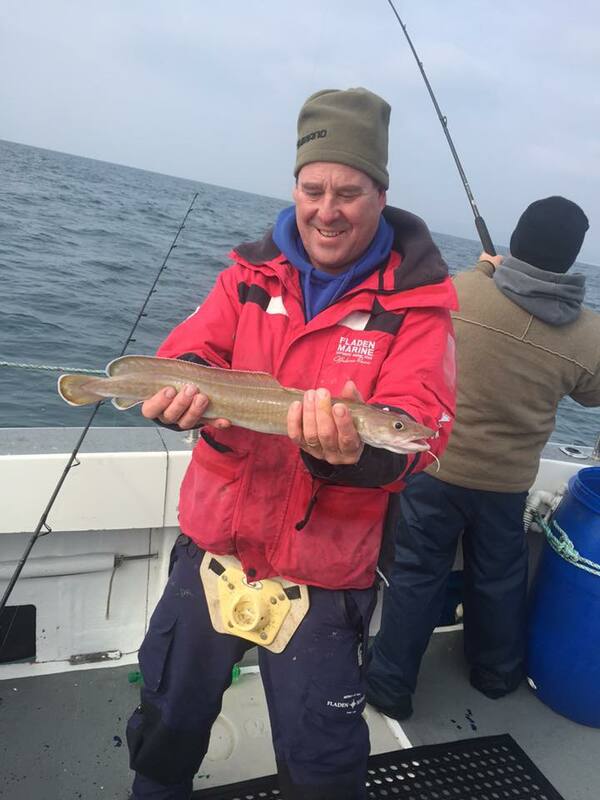 You can often pick up Pollock and Wrasse at the same time. This month is also one of the last for large numbers of Wrasse on bait. Portland Harbour: There has been Garfish, Pollock, Wrasse and Bass all caught in the Harbour the past few days. I have also seen anglers catch Flounder from Hamm beach. Weymouth Bay: lots of different species still being caught from the piers with a few Squid. The easterly wind wont be that good for Squid fishing this week. With a surf running on Preston Beach you have a good chance of a Bass. Fishing Tails > All Articles > Reports > Chesil Beach > Not Tuna but a great day out. 4 Responses to "Not Tuna but a great day out." HI Sean, Had five trips onto the beach in three days by staying in a caravan at Freshwater Beach at the weekend. First cast Friday late afternoon I had a good size Tub Gurnard and when it got dark I was into something heavy but sadly my leader knot gave way at the water’s edge as it reached that washing machine effect on the ridge. Saturday morning the angler next to me landed a decent Sole and a Plaice followed by a small Codling whilst I had a Dab and a few Pout. Evenings I fished from late afternoon til 9.00pm and had some good whiting, lots of pout and dogfish, lugworm were the best bait by far but Weymouth Angling didn’t have anty left on Sunday so my last session was just as good fishing with sandeels, I had frozen blacks but they were a pout magnet. I had a tiny eel, my first in years and Sunday evening there was that amazing sunset. What a great weekend fishing an almost empty stretch of Chesil and just fifty yards from caravan to the beach. Love FishingTails, inspired me to try Chesil again after two blanks. I feel for you losing a big fish. I have lost two this year due to my line parting. Sure you know it already but both species of Shad are Schedule 5 protected species under the 1981 Wildlife and Countryside Act and should be returned soon as possible, unharmed, as they are having a tough time of it. I’ve seen quite a few knocked on the head by folk mistaking them for bass, which is a bit of a shame. At least one black spot behind gill plates is the obvious difference to look for.